Cities – Confianza Consulting, Inc.
Traffic backs up on I-275 in Malfunction Junction in Tampa. Times files. There’s a lot to unpack from the midterms. Will the recounts change the outcome of any of the statewide races? Can polling find a better model, one that predicts the actual winners? Will felons who have served their sentences really get their voting rights back? I’ll leave those to the political experts. Instead, I’m getting my head around what the results tell us about our economic priorities and how we want to pay for them. 1. For now, we’re okay with taxing ourselves. Pasco County residents overwhelmingly voted in favor of three separate property taxes increases to improve parks, libraries and fire rescue stations. They also narrowly passed a fourth increase to pay for a jail expansion. Total cost: $241 million. In Hillsborough, voters passed two additions to the sales tax — an extra half cent for schools and a full cent for transportation. That raises the sales tax to 8.5 percent, the highest of any county in the state. 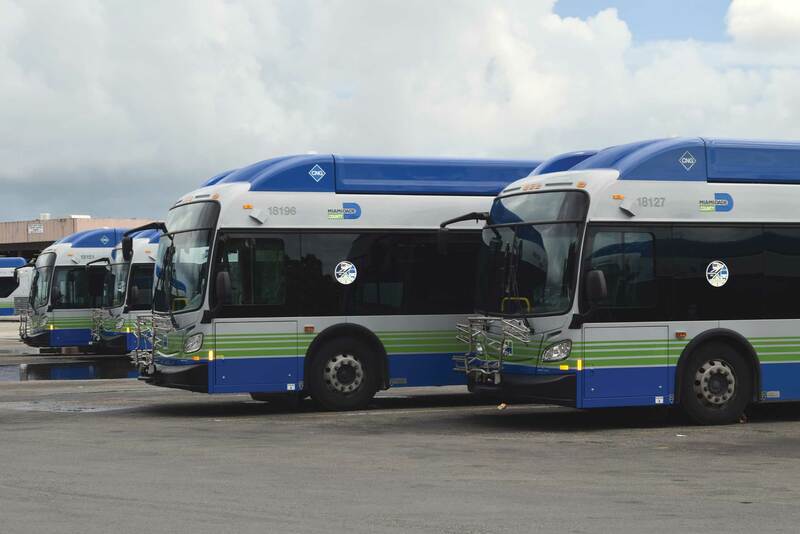 The transportation victory comes after several failed attempts to raise funds for rail and transit in the Tampa Bay area, including a similar effort in 2010 soundly rejected by Hillsborough voters and the disastrous Greenlight Pinellas campaign in 2014. It’s a good time to vote on a tax increase. The economy is chugging along. Unemployment is low. Consumers remain fairly confident about the future. Kyle Simon, 34, who lives in Palma Ceia, said he would have voted in favor of the tax increase anyway, but it certainly helps that people have more money in their pockets. “It takes the sting out of voting for it,” he said. The sales tax passed, in part, because residents experience the transportation problems for themselves, not as some far off problem, said Tampa Heights resident Rick Fernandez, who voted for the increase. They get snarled in traffic or can’t walk safely to where they want to go. 2. But we aren’t so fond of Tallahassee politicians taxing us. Voters easily passed Amendment 5, which will require the Legislature to muster a two-thirds super-majority if it wants to impose, approve or raise state taxes or fees. Blocking proposed tax hikes will be much easier now. The amendment does not apply to local fees or taxes, such as funding for schools. Voting for local tax increases, and at the same time making it harder for the state to levy taxes, makes sense. Traditionally, voters have been more likely to support tax increases if they have a clear grasp of what the money will pay for and that it stays close to home. We don’t like far-away politicians spending our taxes on things we never see or don’t understand. 3. Enough of us were feeling bullish to forgo a tax break. Amendment 1 would have increased the homestead exemption by an additional $25,000, saving many homeowners about $200 to $350 a year depending on the value of their home and where they live. Of the 12 proposed constitutional amendments, it is the only one that failed. Now, most voters — 58 percent — favored the amendment. It was popular, just not popular enough to get over the required 60 percent threshold. The amendment language was a bit confusing, which likely didn’t help. Many voters, however, appeared to heed the cries of local officials, who said they might have to cut services or raise rates to make up for lost revenue. Fernandez said he wasn’t tempted by the tax break. The results show he isn’t alone. Transportation officials say no one has come up with a way to pay for hundreds of pressing transportation needs amounting to some $9 billion. To address this, a citizens group backed by business leaders including Jeff Vinik gathered the signatures necessary to put a one-cent-per-dollar sales tax on the Nov. 6 ballot. Other backers include Tampa Mayor Bob Buckhorn and major local employers. No opposition to the measure surfaced until three weeks before the election, when a tea party-affiliated group that successfully fought transportation ballot measures before in the Tampa Bay area organized a political action committee. Among its arguments, the group says the increase would help make Hillsborough’s the state’s highest sales tax and is unnecessary because county commissioners re-prioritized $800 million of existing revenue for transportation over 10 years that, combined with gas taxes, will fund needed maintenance and safety issues. The local NAACP also opposes the hike, saying it’s a burden on poor people. All for Transportation, the group advocating the tax increase, said the $800 million doesn’t come close to answering current transportation needs or those that will be created by a Hillsborough population increase projected at 700,000 in the next 30 years. If the measure passes, it would amend the county charter to increase the sales tax by 1 percent and would create a 13-member citizen oversight committee to make sure local governments spend the funds as intended. Will Florida’s sleek, for-profit rail project become an advertisement for the limitations of bipartisan compromise? Money train: Brightline, Florida’s new privately funded, not-quite-high-speed rail, will get you from West Palm Beach to Miami in style. Ideology was at the core of his decision. For years, mainstream Republicans have rebuked high-speed rail as socialist folly. (They are hardly kinder to Amtrak, a quasi-public, nominally for-profit entity.) Scott was the latest in a long line of Republican governors—including John Kasich in Ohio and Scott Walker in Wisconsin—to reject Obama’s money on the grounds that high-speed rail was too much of a burden on taxpayers. But a few years ago, a more palatable solution was presented to Florida’s Republicans. The proposed train, called Brightline, wouldn’t quite be “high speed,” which by international standards generally means running on dedicated tracks at speeds over 150 miles per hour, often approaching 200. Brightline trains would run on upgraded tracks laid in the nineteenth century, passing through the centers of many small towns and traversing hundreds of grade crossings, where track and roadway (or track and track) meet. As a result, they would top out at 125 miles per hour. But what really animated Republicans was Brightline’s solution to funding: it would be a for-profit operation funded through private investment. This train wasn’t socialism; it was American free enterprise at work. Yet Brightline, which started running between Fort Lauderdale and West Palm Beach this past January and extended services to Miami in May, has been controversial. While Scott has praised the project for being “100 percent private,” the project is under siege from a broad coalition of Floridians—including many Republicans—who complain that a high-speed passenger train will disrupt their tranquil communities, and who object to the generous subsidies handed out to private investors in the form of what are known as private activity bonds, or PABs—tax-exempt bonds created by Congress and authorized by the U.S. Department of Transportation. Florida’s state Democrats, for the most part, have been quietly supportive of Brightline. So many other countries have unveiled state-of-the-art high-speed rail systems in recent years (Uzbekistan, anyone?) that it’s become almost a cliché to wonder why America hasn’t been able to build tracks of its own. Yet the question of what to do about the impasse—along with America’s degenerating infrastructure more broadly—remains perilously unanswered. Brightline, with its supposed combination of public benefit and private enterprise, offers itself as a panacea to the partisan gridlock. But can a for-profit transportation project adequately provide what has traditionally been a publicly subsidized service? Or will the sleek new trains become an advertisement for the limitations of bipartisan compromise? President Obama wasn’t the first Democrat to make sweeping promises about how high-speed rail would transform Florida. In 1982, the wildly popular Democratic Governor Bob Graham returned from a vacation in Japan convinced that bullet trains were the future. He created the Florida High Speed Rail Commission, a nonpartisan group tasked with determining whether the technology was feasible for Florida. They concluded that it was, and by 1996, it looked as though the project would actually happen. The Florida Department of Transportation agreed to commit $70 million per year for thirty years to build a line between Orlando and Tampa. Companies like Amtrak and the makers of France’s TGV started meeting with the committee to bid for the commission. One consortium even proposed a magnetic levitation train that would travel at 300 miles an hour. By that time, debates over high-speed rail were percolating nationwide. Conservatives objected that it would be an expensive boondoggle leading to bigger government. If countries like Japan and France were surpassing the U.S. in train technology, it was just a sign of their socialist inefficiency. Besides, they argued, we have cars. Democrats, by contrast, were drawn to the broad social benefits of high-speed rail: the millions of construction jobs they believed it could create, the broader economic development it could stimulate, and, perhaps idealistically, the connections it might encourage between disparate communities. In 1992, then candidate Bill Clinton proposed creating “a high-speed rail network between our nation’s major cities.” Once in office, he wound up prioritizing deficit reduction over his campaign promises for infrastructure investment, but he still managed to put in place a plan to create federal-state partnerships devoted to alternative means of transportation. Florida was first in line to receive the benefits. A group of private citizens fought back, led by Dockery. In 2000, following a campaign to which Dockery contributed $3 million of his own money, Florida voted in favor of making high-speed rail a state constitutional mandate. It seemed like Dockery had finally won: construction for a train from Tampa to Orlando was to begin in 2003. But Bush—who later boasted that his nickname was “Veto” Corleone—swooped in to lead an effort to repeal the amendment in 2004. “This little choo-choo could cost us a lot of money,” Bush argued on his way to winning the repeal vote. It seemed clear by that point that Florida’s Republicans would not budge: high-speed rail was all but out of commission. And then Brightline came along. When I flew into Fort Lauderdale in July, I had to rent a car. Florida’s southeast corridor is designed for the automobile, with disjointed trenches of soggy swampland and gated communities joined by an epic sprawl of asphalt and traffic. With the exception of Miami, the cities that run along the southeast coast feel more like a disparate string of small neighborhoods, linked by roads with names like Green River Parkway and South Military Trail that ultimately feed into larger highways like Interstate 95. The Brightline station, built on the outskirts of Fort Lauderdale’s sleepy downtown, stood in stark contrast to its surroundings—a fiercely lit, modern white-winged building spitting out a pair of railway tracks that divide the city. To the east was a mix of fast-rising real estate developments and gentrifying older neighborhoods; to the west, low-income housing. Surrounding the station, on all sides, were streets and highways. Every day, sixteen trains run in each direction between West Palm Beach and Miami, offering a high-end, hospitable alternative to I-95, which runs parallel to the train. We all but glided up the coast, passing backyard barbecues, empty lots, and low-income communities where, as one man later put it to me by way of explaining the poverty, “People bike.” It was a sharp contrast to the scene inside the train, which seemed built to serve mostly businesspeople and tourists. Smiling stewardesses in matching violet uniforms offered riders in the “Select” class unlimited free beverages. One stewardess, whose hospitality recalled the long-lost days of Pan Am, explained to a middle-aged blond woman who was sipping a vodka with lime that she could even blow-dry her hair on Brightline on her way to work. “It pays to relax!” she said with a laugh, continuing down the aisle. It was indeed. This, Brightline seemed to be saying, was no Amtrak ride. To its boosters, Brightline is a testament to what free enterprise can accomplish—running on privately owned tracks that simultaneously run fleets of money-making freight trains. But the reality is that hauling people has been a money loser since the 1960s, and Brightline wouldn’t exist without some form of government backing. The project was the brainchild of Wes Edens, the cofounder of Fortress, one of Wall Street’s most powerful private equity firms, which bought Florida East Coast Industries for $3.5 billion in 2007. Eight years later, the company came up with a plan to make passenger trains profitable again. The trick was to get approval from the Florida government and the U.S. Department of Transportation to allow Brightline to float more than $1.7 billion in private activity bonds. PABs, originally designed to attract investment to private projects with public benefits (like, say, a new hospital), are appealing to investors because the interest they pay is exempt from federal income taxes. For Brightline, they provided a way to finance private infrastructure using public tax subsidies. Although Brightline’s holding company is responsible for paying back the debt created by these bonds, the tax exemption is a pure public expenditure. In 2000, Florida voted in favor of making high-speed rail a state constitutional mandate. But Governor Jeb Bush swooped in to lead an effort to repeal the amendment in 2004. “This little choo-choo could cost us a lot of money,” he argued. If all goes right, Brightline will create so much economic development in the communities it serves that it will more than make up for the cost of its tax subsidies. The taxpayers will in effect get a free passenger rail service. But if that sounds too good to be true, maybe it is. The business community’s enthusiasm has been key to Brightline’s success. More surprising, though, has been the support of libertarians—erstwhile high-speed rail skeptics who became cheerleaders for Brightline. One of these supporters is Bob Poole, founder of the libertarian Reason Foundation and a member of Scott’s transition team in 2010. The Reason Foundation was instrumental in persuading the governor to reject Obama’s proposed project in 2011. When Scott announced that he was killing the project, he cited a Reason Foundation report as the basis for his decision. Private activity bonds are appealing to investors because the interest they pay is exempt from federal income taxes. For Brightline, they provided a way to finance private infrastructure using public tax subsidies. Yet even if Brightline wins the praise of self-described market conservatives and Chamber of Commerce types, it’s having a harder time in some other Republican quarters. Florida Senator Marco Rubio, for example, has become an outspoken critic. A few months after Brightline began operations, Rubio wrote a letter to U.S. Transportation Secretary Elaine Chao questioning the legitimacy of its funding. He argued that the project doesn’t meet the standards outlined by the Department of Transportation, which provide that “high-speed rail” must run at a base speed of 150 miles per hour to qualify for funding. Other state Republicans chimed in with letters to Chao. Meanwhile, opposition is strong at the local level, including among the many Republican retirees who live along Brightline’s right-of-way. A month after the train began operating, a group calling itself Citizens Against Rail Expansion (CARE) filed a lawsuit complaining of crony capitalism. CARE’s suit challenges the legality of Brightline’s PABs while also raising environmental and safety concerns (in six months, for instance, Brightline trains ran over and killed nine people, though more than half may have been cases of suicide). The lawsuit is currently awaiting a court date. Governor Scott—who is running for Senate this fall—has not responded directly to any of the complaints, beyond repeatedly stressing that Brightline poses no risk to taxpayers. He may be forced to speak more on the topic soon. In August, the Miami Herald reported that Scott and his wife had invested at least $3 million in Fortress, the investment group that owns Brightline, and have earned more than $150,000 in profits from their investment. When I contacted Scott’s office, his spokesperson, Lauren Schenone, said that Scott’s investment was part of a fund “managed by an independent financial professional who decides what assets are bought, sold or changed,” and that Scott, a multimillionaire, has no control over it. “The Governor does not discuss the First Lady’s investments with her or with her financial advisors,” Schenone added. In August, Brightline got the green light from the Florida Development Finance Corporation to act as the conduit issuer for almost $1.8 billion in PABs, enabling the company to go forward with what they are calling “Phase II”: trains from Miami to the Orlando airport. Construction has begun, with the upgraded track cutting through one of Florida’s most densely populated arteries—a predominantly Republican corridor where many residents are adamantly opposed to seeing fast trains running through their backyard. Ironically, it’s a “backyard” that likely wouldn’t exist if the railway hadn’t been built through it 124 years ago. Hobe Sound, in Martin County, is part of a cluster of small communities that make up the “Treasure Coast,” a sprawling beach with silvery blue water where sea turtles nest and “downtown” is a single street with a theater, a café, a barber shop, and a restaurant. Inland, wild swampland wraps tightly around spruced-up golf courses, a parody of the eternal combat between chaos and order. I followed Hanlon by car to Confusion Corner, which turned out to be the local nickname for a congested roundabout in the middle of the small town of Stuart. Bisecting one edge of the clogged circle are the railway tracks Brightline proposes to use. As we stood there, a freight train passed by, and Hanlon pointed to every “confused” car that had to sit a little longer in traffic. I didn’t completely understand the hype. Trains had been running up and down the tracks for as long as Martin County had existed. While Brightline would add to that traffic, it didn’t seem like something Floridians—who appear to be culturally habituated to congestion—hadn’t seen before. “Is there anything Brightline could do to change your mind?” I asked Hanlon as we watched the freight chug past. CARE casts itself as the voice of the community—a bipartisan advocate for what it claims are the roughly ten million people who live in areas that could be affected by rail expansion. At the same time, CARE has powerful supporting players of its own. In the group’s short life-span, it has raised $2 million from private “crowdsourcing” (the community is mostly wealthy retirees). It is backed by the former CEO of American Airlines and employs a global PR firm and a legal team consisting of two county attorneys and two outside counsels. Brightline is continuing to expand. In September, the company announced that it would be starting a high-speed passenger service connecting Southern California with Las Vegas. But it’s not clear how successful the Florida operation has been. When I spoke with Goddard, he said Brightline’s first-quarter numbers were “higher than expected.” The company generated $663,000 in ticket revenue, and carried close to 75,000 passengers, from January to March. But according to Brightline’s unaudited quarterly report, the company lost roughly $28 million in the same period. A Brightline spokeswoman, however, said those numbers only reflected ridership for Brightline’s introductory service, and added that ridership and revenue increased 35 percent from January to March. The project’s fate may depend on whether it can sell the more than $1.1 billion in remaining PABs by the end of January (an extension granted by the Department of Transportation in May). If Brightline fails, private investors will lose their money, with no responsibility on the government itself. But what may be lost, in that case, is the opportunity to have applied the PABs to a project that could have succeeded. In a way, the combination of private financing for public railways is nothing new. From the beginning, rail infrastructure in the U.S. was privately owned, but largely financed through considerable grants of public land. Railroads, in turn, used a small part of the land for their rights-of-way, selling the rest at an enormous profit. The very track on which Brightline runs exists because back in the 1880s Florida gave Henry Flagler, one of John D. Rockefeller’s close friends, a grant of more than two million acres of land in return for his building the Florida East Coast Railway. That system hasn’t worked out so well either. Outside of the corridor between Boston and Washington, D.C., and a few other routes, Amtrak trains run on tracks owned by private railroads. These railroads charge Amtrak rent for using their rails and often for the cost of maintaining their infrastructure, then routinely delay Amtrak trains for hours by making them cede priority to freight trains. Republicans in Congress keep insisting that Amtrak must nonetheless make a profit on each train, even if it means cutting service standards to the bone. Recently, under pressure to show a profit, Amtrak has cut dining car service on two of its long-distance trains and is rapidly cutting back the number of manned stations across the country. Maybe a model like Brightline’s is the best America can do. But it doesn’t solve the basic contradiction between expecting trains, or any other form of transportation, to turn a profit on every run while also expecting the system to serve the public’s broad needs for service. When I left Florida to return home to New York, I decided to take Amtrak. The ride from Tampa took twenty-five hours, traveling along tracks, congested with freight trains, that are owned by the CSX corporation—or, more exactly, by the hedge funds and other financial institutions that own CSX. The station in Tampa was true to Amtrak’s reputation—a decrepit and tired-looking gray. Water dripped on our heads as we waited for a man with a whistle to allow us to board. But every seat was full. Next to me, an elderly woman was traveling to visit her son, somewhere in Virginia. She couldn’t drive and depended on Amtrak to see her family. She asked what had brought me to Florida, and I explained that I was writing about Brightline, the new high-speed rail. “What is high-speed rail?” she asked, yawning. For all its built-in handicaps and acute underfunding, Amtrak remains an essential public service—and a social good. As an eerie midnight blue set in, and everyone fell asleep, the train rocked forward, stopping deep into the night in the tiny hamlets of the south—the Villages, Waldo, Ocala, Wildwood—to carry passengers who look very different from those riding Brightline to the cities of the Mid-Atlantic. I woke up when the sky turned white and we were passing through someone’s backyard in rural South Carolina, a thick fog settling in over tangles of overgrown mossy fields. Only twelve hours had passed; thirteen, give or take a few, to go. Maddy Crowell is a freelance journalist based in New York. 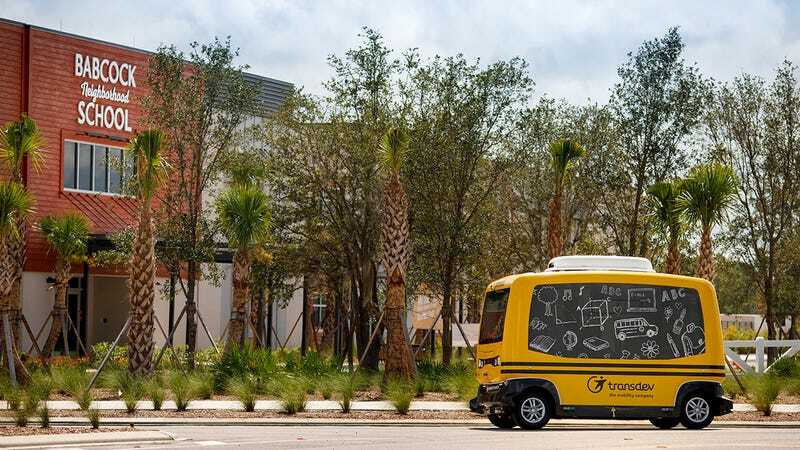 The letter, issued on Friday to Transdev North America, directed the transit operator to stop transporting kids in the Southwest Florida community of Babcock Ranch on the company’s EZ10 Generation II driverless shuttle. In a press release, NHTSA said the company had received permission to temporarily import the driverless shuttle for testing and demos. “Transdev failed to disclose or receive approval for this use. School buses are subject to rigorous Federal Motor Vehicle Safety Standards that take into account their unique purpose of transporting children, a vulnerable population,” the agency said in a statement. The 12-person shuttle picked up kids from a designated area and a safety attendant would always be on board, the statement says. “Eventually, school shuttle service will be available to students and parents on demand, door to door, using an integrated app on their smartphones,” Transdev and the city said, making it clear as day that it would begin operating an autonomous school bus. Autonomous vehicle definitions get confusing fast, and NHTSA describes this as a “driverless” shuttle. There’s a safety operator on board while students are riding to make sure everything’s running smoothly, but it’s probably a fair choice of words here. Transdev said in the release that the “route and operation will be fully autonomous.” The vehicle’s max speed is 8 mph. Something about this strikes me as odd. If Transdev indeed failed to notify the agency about its plan to use this as a school shuttle, then why did NHTSA take nearly two months to act? Nonetheless, NHTSA suggests Transdev copped to … something. “Transdev has informed NHTSA that it will stop unapproved operations,” the agency said. I asked Transdev for comment, and I’ll update the post if the company offers a response.